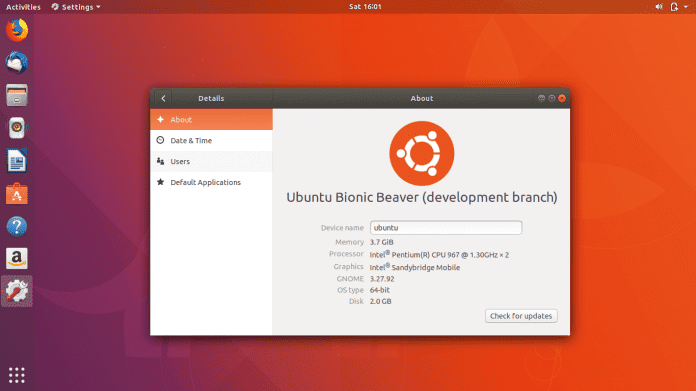 Ubuntu, which is one of the most popular desktop Linux distributions, has finally released the latest Long Term Support (LTS) version of Ubuntu – version 18.04, after numerous alpha/beta releases over the past few months. It is now available for download for workstations, cloud, and IoT (Internet of Things). Ubuntu 18.04 LTS, also code-named “Bionic Beaver” features GNOME 3.28 as the default Ubuntu desktop environment instead of Unity and the GNOME apps have been updated to version 3.28. The kernel is based on Linux 4.15 and LibreOffice 6.0 is included by default. Further, on-premises and on-cloud AI (artificial intelligence) development within Ubuntu will be enhanced by the integration of Kubeflow and a range of CI/CD tools into Canonical Kubernetes. Kubeflow, the Google approach to TensorFlow on Kubernetes, is a machine learning (ML) library built on Kubernetes. Other changes include the return of Xorg as the default display server in Ubuntu 18.04 LTS, which was exchanged for Wayland on Ubuntu 17.10. However, the company is likely to change the default display server back to Wayland in Ubuntu 20.04 LTS. Although, it is worth noting that Wayland is still available as an option, but is not the default anymore. Further, the Calculator, Characters, Logs, and System Monitor apps are now installed as snaps if a clean install is performed, and Emojis will display in color in most apps. Another big change reduces the number of supported systems, which means Canonical will no longer provide 32-bit installer images. Starting with Ubuntu 18.04, Canonical will start collecting system usage data, which includes info about the device manufacturer, the CPU model, the desktop environment, the system time-zone and the installed packages. While the data collection option will be turned on by default, users will be able to opt-out of the data collection by turning off the option manually before connecting to the net, just like in Windows. Further, Ubuntu 18.04 LTS has an option for a “minimal install,” which only installs a basic desktop environment, a web browser, and a few core utilities, removing many of the default apps that come with the full release. Speaking about security, the company explains, “In Ubuntu 18.04 LTS, gcc is now set to default to compile applications as position independent executables (PIE) as well as with immediate binding, to make more effective use of Address Space Layout Randomization (ASLR). All packages in main have been rebuilt to take advantage of this, with a few exceptions. Mitigations are in place to protect against Spectre and Meltdown.” Canonical is also continuing to support the OpenStack Infrastructure-as-a-Service (IaaS) cloud. Sinc, Bionic Beaver is an LTS release, it means it offers an impressive five years of support. “The main archive of Ubuntu 18.04 LTS will be supported for 5 years until April 2023. Ubuntu 18.04 LTS will be supported for 5 years for Ubuntu Desktop, Ubuntu Server, and Ubuntu Core. Ubuntu Studio 18.04 will be supported for 9 months. All other flavors will be supported for 3 years,” says Canonical. You can download the Ubuntu 18.04 LTS ISO file right now from the download page or the release page. Sounds like they’re going mainstream… soon we will have to pay to use Ubuntu you just watch.